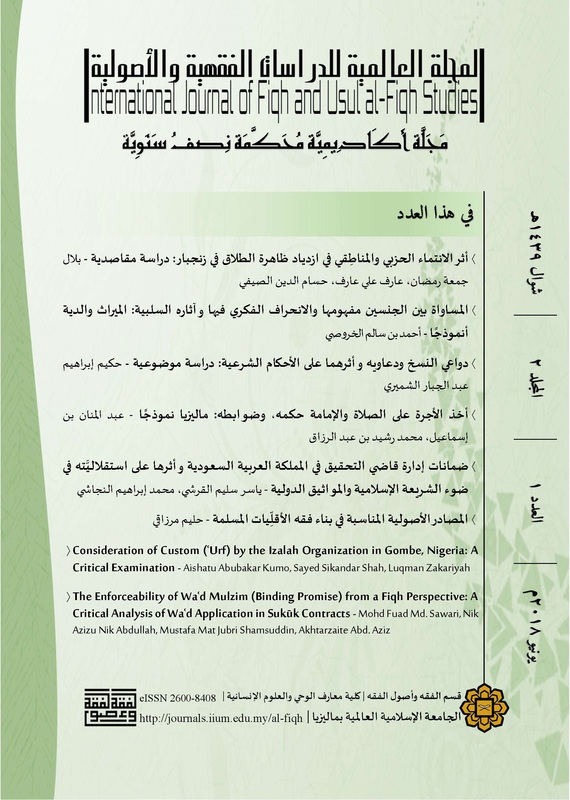 The purpose of this research is to study the regulations that the fuqaha´ have dealt with on permissibility to take the salary for pure acts of worship and others, considering the transfer of its usefulness or not in prayer and imamate. This will be done by answering two main questions: what goes into the realm of pure acts of worship and what does not? ; and to what extent transferring of its usefulness or not is considered for permissibility to take the salary for them? The research has followed the descriptive and analytical methods. It has also followed applied approach to what is happening today in Malaysia as a model. The researcher has reached a number of conclusions concerning the validity of taking the salary on the imamate not prayer itself. The regulations determined by the jurists are applicable to the imamate not prayer itself. The applications carried out in the Malaysian state about taking salary on the imamate are sound because its conditions and regulations are fulfilled, which led to consider the state of Malaysia as a country that takes care of the affairs of the Islamic religion despite the challenges faced both inside and outside.